Some movies are just givens when it comes to lists like this. “The Texas Chain Saw Massacre” is one of them. Tobe Hooper‘s grizzly tale of a deranged family is loosley based on the real-life crimes of cannibal Ed Gein. In the movie, Leatherface would be the part of Gein, only an exaggerated version. The movie follows five friends who are out and about doing basically nothing. They pick up a hitchiker and it’s all downhill from there. They quickly let off the nutjob, but they haven’t seen the last of them. They make it to their destination and are soon being hunted by the crazy hitchhiker’s cannibalistic family, including Leatherface and his chainsaw. One by one, they are brutally massacred until only Sally remains. She is being tortured by the crazy family when she manages to escape. This movie is terrifying. It’s gritty and disgusting (in a more respectful way than say Rob Zombie’s gritty and disgusting). It’s intense. Few horror movies make me uncomfortable, but this is one of them. I think my blood pressure rises as I feel like I, too, have to escape the skin-wearing monster’s chainsaw. As a bonus, the 2003 remake makes a very nice companion to this film. It’s one of the few remakes that is actually a good movie. It follows a lot of the original when it comes to grit and gore, but it goes a little too far with the plot (which we all know is not important when it comes to horror movies). But it also is a good movie. It would probably come in at about 35 on this list if it went that high. Did You Know? 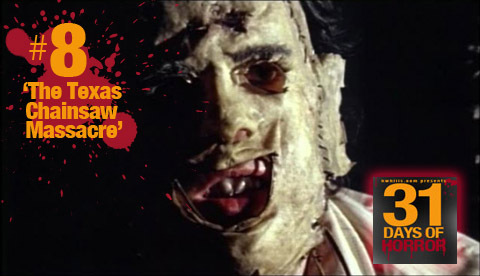 The film was originally entitled “Headcheese”, but was filmed as “Leatherface”, then changed again at the last minute to “Texas Chain Saw Massacre.” Wise choice!